The year was 2011. Bitly was at a crossroads. Over the previous three years, we had developed the internet’s definitive link shortening tool, shortening millions of links a month and processing millions more in clicks. We were growing like crazy. We had raised $1.5 million in seed funding in 2008 and another $2 million in Series A in 2009. In 2010, we had ambitious growth plans, raising debt financing in the first half of the year and then $10 million in Series B funding in October, largely to support our scaling infrastructure during the hypergrowth of our free product. One problem. While we had created a tool that nearly everybody used, we hadn’t actually built a sustainable business. In fact, we hadn’t built much of a business at all. We got stuck in the all-too-common trap of building a user-base and worrying about revenue later. But that’s a dangerous game to play, and the money dries up quickly. In addition to that, Twitter introduced t.co, their own link shortener, and the market flooded with competitors. In that limbo, there were shake-ups within the company, replacing our founding team and executives several times as we sought to define the future of Bitly. We wanted to create a world where we could serve our millions of users around the globe while also building a sustainable business, a difficult thing to balance. With little venture capital left, we were forced to evaluate our options. We tried several things that didn’t get traction: Bitly Pro for bloggers and publishers, Bitly TV (yes, really), a social news app called news.me, which is now part of Digg.com, Bitly for Feelings, and an experiment to become a data platform that plugged into paid advertising platforms. But nothing quite clicked (pun intended). We were all over the place. By the time I joined in late 2013, we had already raised another $15 million in venture capital. Expenses were still running high, but we were beginning to show some of the right signs. As we worked through our next steps, with a few false starts along the way, it was imperative that we make a clear decision about what business we were in. Were we going to build innovative consumer products? There was no shortage of very cool ideas. But when we looked at what we had, we realized that the answer had been right in front of us all along. We had some of the largest brands and publishers using our product to help make their links perform better. Having spent the past twenty years of my career building businesses that helped marketers succeed, I knew how rare it was to have such a strong base of direct-to-brand relationships. The link isn’t merely a way to get consumers from Point A to Point B; it’s the common bridge within and between every marketing channel. Marketers around the world were already using Bitly to brand and shorten their links, but the more advanced marketers were using our analytics to help understand their performance across an increasingly large and complex array of channels; SMS to paid acquisition, email marketing to social. We knew we were in a unique position to solve the omnichannel challenge that marketers were wrestling with. We had some of the most powerful analytics that existed when it came to links and content consumption, and a killer team with the technical acumen to build something remarkable. So we set out to create that solution. In 2012, we introduced our premium version of Bitly, today called Bitly Enterprise. However, it wasn’t until late 2013 that we truly committed to that premium offering, as the core of our business. By the end of 2014, we had built a real freemium SaaS business. Revenue was running at a $10 million run rate and our customer base passed 700, with our free user base continuing to grow month over month. In 2015, Bitly reached profitability for the first time ever — what I believe will become an increasingly critical benchmark, especially in today’s environment. We moved to a larger office in the heart of Silicon Alley and ended the year with 80 employees and a $14 million run rate, crossing over that important milestone of $1M in MRR. We also opened up two additional offices, one in SF and one in Denver to expand our engineering presence and better serve our customers on the West Coast. And we added several key pieces to our executive team — Matt Thomson as CPO, Susan Riskin as VP of HR and Andrew Dumont as VP of Marketing. You may still be asking yourself, what does our enterprise product actually do? I’m glad you asked. Customers including half of the Fortune 100, like Pepsi, GE and Samsung, to startups with fewer than 100 people are coming to us to host their branded short domains, develop omnichannel analytics dashboards, create deep link functionality for better mobile experiences and app re-engagement, and much more. We’ve had 10 consecutive quarters of net negative churn and 85% gross margins. If I was on stage right now, I’d repeat that over and over again because of how proud I am of it. This shows us that our paid customers love what we’re building, perhaps the most important metric of any SaaS business. But we still have a long way to go. If this is the first time you’ve heard that Bitly has a business model… and a paid product… and paying customers, unfortunately, you’re not alone. That’s part of the reason we took the time to write this and put a stake in the ground. Our number one challenge is balancing our free product with becoming the enterprise Link Management Platform that marketers are telling us they need. 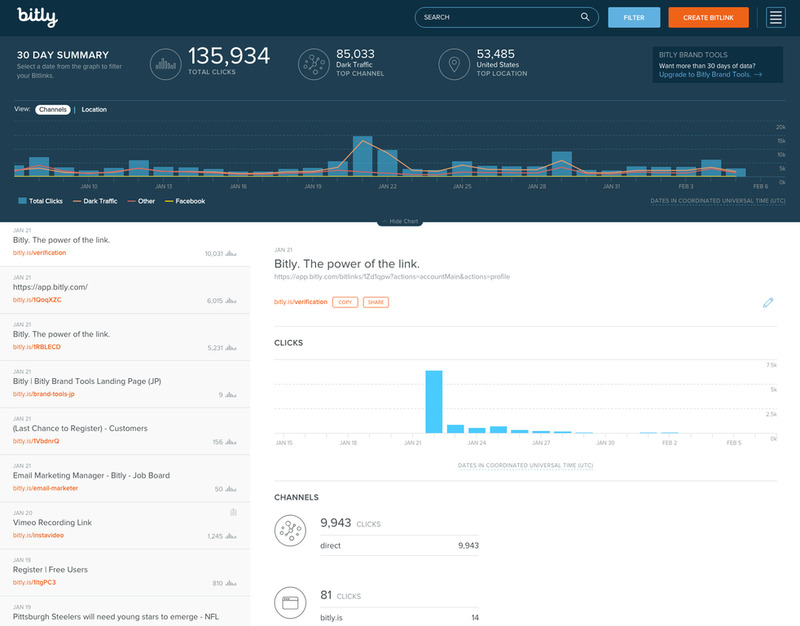 For most of our customers, Bitly has been more than a link shortener for years. For others, we’re still just the place with the pufferfish, Chauncey McPufferson. We don’t have any plans to get rid of Chauncey, but we do want to make sure that, in 2016 and beyond, Bitly is not just a tool for shortening links and tracking clicks, but the Link Management Platform that connects the dots between every channel in a marketing organization. The link really is the common thread. To do this, we’ve been completely revamping our free and paid products. That starts with a sleek new user interface (below), available now for all new free accounts, and will be rolled out to everyone in the coming months. We’re also pushing heavily into mobile, expanding our deep linking functionality so that brands can provide seamless app-to-app experiences for their users, boosting app re-engagement and installs.. This all goes to our ultimate goal: using the power of the link to optimize the customer experience. With the billions of clicks that Bitly processes each month, we can offer unprecedented insight into the journey that each individual takes in content consumption — from what they consume to the device they consume it on. We believe in a future where marketing can shift from one-to-many communication to one-to-one communication, and we’re uniquely positioned to tackle that challenge with our scale. Every month we process 15 billion clicks and are approaching 6 billion first-party active cookies per month. 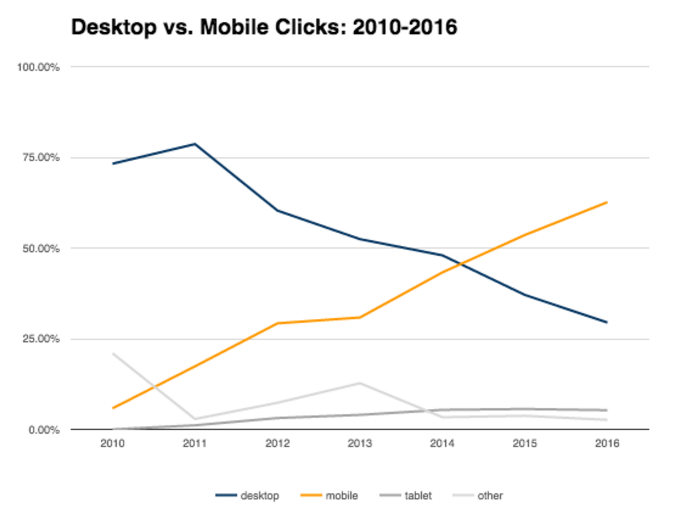 Bitly is building a company that adds increasing value to marketers, even more so as the shift to mobile continues. What started as short links on Twitter has morphed into much more. We’re positioned for long-term relevance, with the link at the core. The enterprise product we’ve been building is finally coming into its own and our free product is maturing well with the introduction of our the latest version. If you haven’t heard much from us lately, it’s not due to stagnation. We’ve been building. It has never been a more exciting time to be at Bitly. We’re a crucial component of how the world uses the Internet and we are more confident than ever that it’s a mission we’ll be fulfilling for a long time to come.